December 18th , 1987 was the day when Benazir Bhutto got married to Asif Ali Zardari. Exactly 2 decades & a few days later ; the marriage ended but with the martyrdom of Benazir Bhutto. Still many wondered that why would she choose such a man for such a sacred relationship but than she was living in a country where she was fighting and facing tyranny and who else could have fought it better on her side than the master himself i.e. Mr. Asif Ali Zardari. A man with no solid educational records . A man with no political history who in fact lost even a district council election in 1983 . A man touted to do real estate business for a few years . The only accomplishment he had was being the son of a feudal found himself in the midst of a goldmine of life term opportunity when he entered into marriage with Benazir Bhutto . Some say he during his times tried his luck with acting, boxing, polo and as per someone tried briefly to be a college Badmash but was never successful in doing anything in his life. He lived a life of an unknown struggling feudal son like many around him till 1987. Though he was a hidden factor in the first ouster of PPP government but Mr. 10% was the worst thing which could have happened to our country entering into democracy after more than a decade of dictatorship. The ball got rolling in the wrong direction. The joke in our neighboring India is after you shake hands with Mr. Zardari make sure you have returned with 10 fingers still. Whilst if a history of smart corrupt politicians is written ; he would definitely top in it. Maybe by introducing Zardari along her side in Pakistan Politics . Benazir wanted to avenge Pakistan of robbing her off her father. This man with no experience headed our Investment Minister, IB and later FIA. Than he became the chairman of Environmental Protection Agency and under its garb extorted millions off from industrialists by issuing them notices for failing EPA standards. Wonderful ain’t it that a man who was running a real state business suddenly got a chance to head some of the key positions of the country not forgetting the role of being a feudal husband of a Prime Minister. The Tyranny went on …..
Post the fall of PPP’s second term. He was arrested . Rightfully so I guess and unfortunately was later released . Again at the cost of giving democracy to Pakistan . Benazir Bhutto instead of negotiating better for her country . Got him out of jail and in 2004 got him out of Pakistan. Well since she is no more I would keep control over my opinion about her for now. Again when NRO was being formulated with President Pervaiz Musharaf ; Benazir Bhutto instead of negotiating terms for Pakistan and its poor was maneuvering for saving her husband’s head and that of his cronies. Come December 2007 she was gone. And left a legacy of Mr. Zardari for Pakistan. I am sure if Mr. Bhutto could look down upon Pakistan today ; he would be smiling and saying “Good that Pakistan got Zardarized . After all I deserved better” & the founders of our nation must have gotten tired of rolling up in their graves seeing this mess. I am sure that they didn’t have a man like Zardari in mind when forming this nation. So here begins a new era in the name of Democracy ; the era of Presidency . I could not believe that after the ouster of a man like President Musharraf who gave Pakistan the standing in everything but just not democracy . 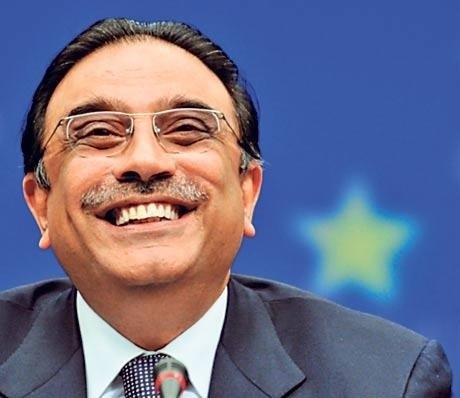 Zardari became President Zardari. Wonder why he chose to color his moustache during the burial of her dead wife whilst the tinge of white is visible now a days. A mask I suppose to make fool out us. We are so thankful for his support of “Pakistan Khappe” slogan and I am sure that he knew ; he could loot it more so he wanted the cash flows rolling so a live Pakistan was better for him than a divided Pakistan with so much to put his hands on. But I must ask since he became the President what has he done to sustain the nation . Pakistan has gone to worse in everything. Terrorism is at its heights & Corruption is beyond heights. What type of the leader of the nation he is that apart of minting money and scheming under the guise of mask of innocence he tries to wear? Under his tenure the poor have become poorer , tyrants have become bigger tyrants. He didn’t achieve a single project which would contribute to Pakistan’s infrastructure in the last 5 years. The only single achievement I could think of his that he has managed to get his son a job as the Chairman of PPP. Forget Pakistan, what has he achieved for his rural Sind. If it was such a great place to live than why all well to do Sindhis are doing in Karachi? Karachi burns as his goons like Zulfiqar Mirza who openly claimed to distribute 350k plus weapons in Karachi has spearheaded the campaign against the city under the guise of nationalism. Baluchistan burns where the poor Baluch are against the wall and the Shia Hazara community hunted. KPK burns with hundreds getting killed by the month and the war against terror far from finished. I am sure the west is happy from him as they got their prize of a dead OBL under his tenor. The only province is Punjab which is less effected as luckily the people of Punjab are beyond his governance due to PML-N government over there. Though he became the president but the DNA of tyranny didn’t die of him but infact it has mutated into hypocrisy where he for saving his power has pushed the nation into a pit. No respect for judiciary, back tracking on civil rights of the people and commitments to allies. Forget Sindh urban . The people of Sind should ask him what has he done for Sind rural . Name one large scale project he has accomplished. The other achievement I can think of his recently completed home in Lahore and that too as a gift . Yes! he has successfully achieved one more thing and that is dividing the nation to the root in the name of ethnicity, sectarianism , caste, creed and religion. Instead of uniting the nation ; he has given us a divided nation. Still, he and his cronies has the audacity of come and talk about their successful tenor on Media. Last time our people voted emotionally and made a tyrant into a president who has turned into a hypocrite . I wish if elections happens soon which are looking difficult as per my limited understanding. The hypocrite is thrown out for good and shown no quarter for bringing the nation to this level. But again if wishes could have been true I would have gone back to 1987 and would have stopped Benazir of marrying this man. As Pakistan always deserved democracy but they never deserved a Zardari….. Pakistan Zindabad! Previous Post Previous post: An IBA graduate who is strongly opinionated ..
You have drawn very sparkling and thorny picture of Mr. Zardari from his start to the stage where he is now. It’s true that he did nothing for Sind urban even he also did nothing for rural Sind as well. See the interior Sind where life is running at extreme poverty, there is no Roti, Kapra & Makan, people really living in huts, in an earthen house, use woods as a fuel for their stove, no gas, no electricity, no clean water to drink, no sewerage system, no govt. hospital in the radius of 50 kilometer, no transport, no school. Every year we lose 10,000 lives, when flood comes but no solution at country level; other provinces are also affected badly. In Karachi killing and killing and it has been the crying issue of Karachi, multi-language are spoken in Karachi and everyone claims it is ours, Bloch says it is ours, KP says it is ours, MQM says it is ours while Karachi feeds to everyone that’s why it has engulfed with multiple problems. The reason to establish local administration in Karachi was to manage the city in a well-organized way but due to political reason, Sind Nationalist who had been misguided, cropped into the way of development which Zardari being a chief executive of the country could have convinced and assured them. Anyhow let’s hope for the best for the betterment & advancement of the masses if we get a good leadership. Nice Article … but in the start your mentioning of Martyrdom of Benazir reduced the overall morale value of the article … have courage … this is what is lacking in a lot of Pakistanis.